The "Original" Stovetop Smoker now has a little brother. 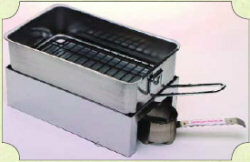 Can be used on stovetop or outdoors using sterno, campfire or gas burner. Includes a stand and a sterno holder camping and backpacking.